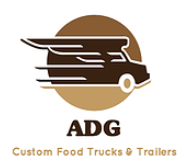 Description: Despite a manufacturing facility based in Florida, ADG Custom Food Trucks has and can build mobile vending units for people throughout the US. Whatever you can imagine we can create, from a small hot dog stand to a 20′ Food Truck, though lately we’ve only been working on the truck builds. Each truck is built to fit your needs and fully equipped from the start. To see what we can do for you, contact us via phone or website and let’s get started. Customer Reviews: None yet. Contact us to leave a review.